Congratulations! You are now enrolled in the Understanding Modern Violence course. A great companion to working through the Understanding Modern Violence course is our Human Violence Handbook. 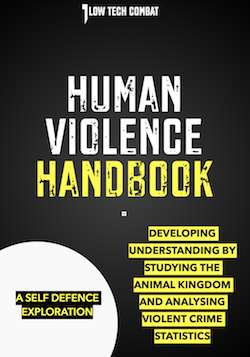 Because you have just joined the Understanding Modern Violence course I would like to offer you a special one-time-offer of a 50% discount for the Human Violence Handbook as it will really help your learning. The coupon code to claim your 50% discount is UMV. I won't be offering it again. Once you create your own unique log-on you will have access to the course. The course software platform will keep of your progress between sessions and it works equally well on desktop and mobile. Yes, this is a proper course using proper course software and lessons etc. Enjoy the course! If you have any questions or feedback about the course please feel free to email me directly. You can just reply any of my emails I send you and they will come directly to me.